I’m not going to pretend that this is any kind of traditional tabbouleh. This is *my* tabbouleh. While tabbouleh is traditionally made with bulghur wheat, I have always preferred making it with couscous. 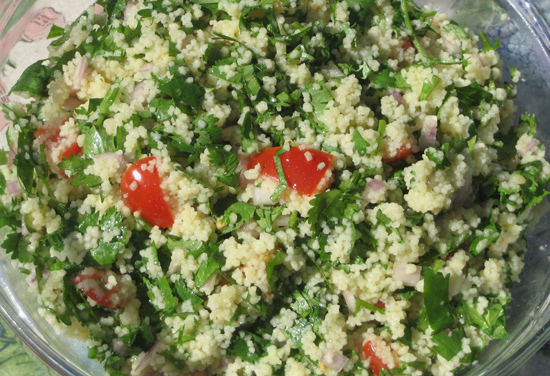 This particular tabbouleh recipe has a nice yet subtle lemony flavor, not too strong or tart. I encourage anyone to modify it based on personal preference. I sometimes double the parsley or tomatoes, depending on my mood and what is available, and leave out something if the cat has gotten to it on the counter (he prefers people food). 1. Cook the couscous by boiling the water or broth and adding it to the dry couscous (or follow the directions on the box if the ratio is different). When the couscous has hydrated, fluff with a fork and let cool. 2. Place all ingredients in a bowl and fold gently to mix, spreading the oil and lemon juice evenly throughout the mixture. Almost any vegetable will go well with this recipe, so feel free to add anything to your preference (e.g. grilled zucchini is great). This goes down particularly well for a summer meal.